e-Therapeutics is a pioneer in the field of network-driven drug discovery, NDD, using big data advanced network analytics and machine learning to identify compounds capable of significantly disrupting disease relevant biological networks. Just as big pharma is looking at in silicosolutions to address the ongoing R&D productivity issues, e-Therapeutics is demonstrating the utility of its platform in areas of current interest. This fuels our confidence that the company will sign one or more drug discovery alliances in the coming year. 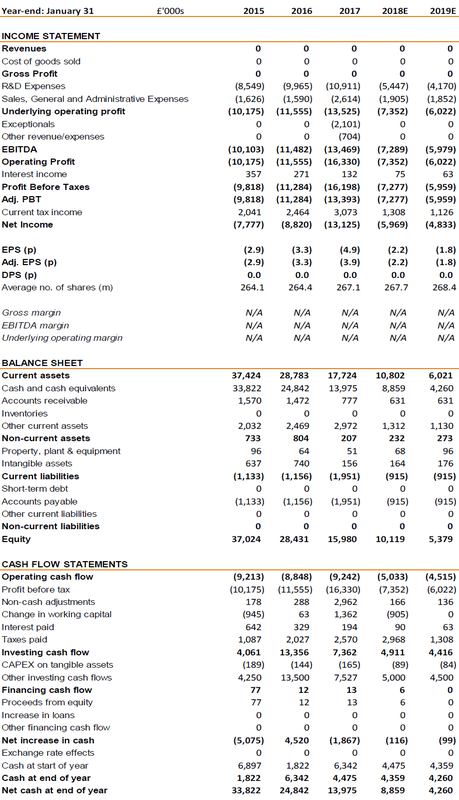 To be conservative, our DCF valuation is unchanged at £53.8m or 20.4p/share. Growing interest from big pharma in in silico drug discovery The pharmaceutical industry is traditionally cautious in embracing new technologies. But, faced with persistent R&D productivity issues and the clear advances in in silico drug discovery, all big pharma companies appear to be keen to explore the potential of this new approach. In the last six months, AstraZeneca, GSK and Sanofi have formed collaborations in this field. Initial data from immuno-oncology programmes are promising Both the tryptophan catabolism and checkpoint signalling projects are at early stages in drug development. That said, the initial data from both suggests that partners could be interested in the programmes. e-Therapeutics has already identified compounds that are as effective as Incyte’s IDO1 inhibitor at preventing tryptophan breakdown, and small molecules with comparable or better activity to the checkpoint inhibitor antibodies, Keytruda and Yervoy. Maintaining the company’s leading position e-Therapeutics has already shown the strength of its NDD platform by successfully validating the approach in eight discovery programmes in different therapeutic fields. But it is continuing to invest in the platform to sustain its leading position. These improvements should enhance its compound database, support elucidation of the mechanisms of action, and enable the targeting of gene regulation. 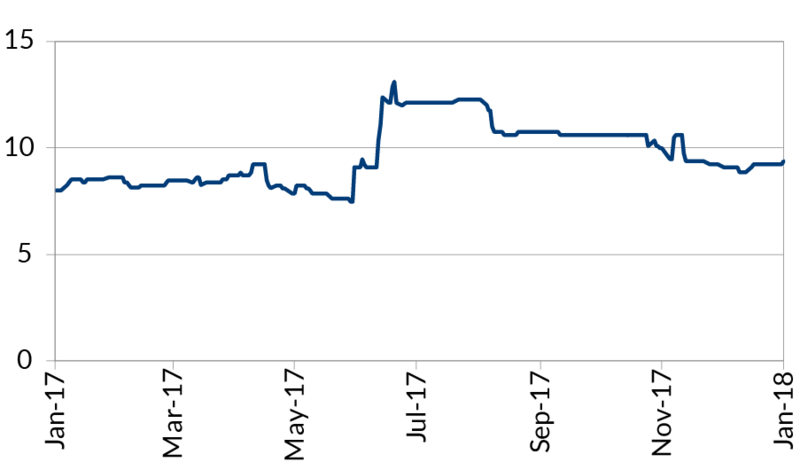 Valuation maintained at 20.4p/share The progress by the company and growing interest by big pharma in in silico means that we are increasingly confident that e-Therapeutics will sign one or more drug discovery alliances in the next 12 months. However, in line with our conservative approach, we are maintaining our valuation at £53.8m, equivalent to 20.4p/share. Events, both externally and internally, should enable e-Therapeutics to execute a drug discovery collaboration deal in the coming year. The pharmaceutical industry is increasingly exploring the potential of artificial intelligence and machine learning to help them solve the continuing issue of weak R&D productivity. At the same time, e-Therapeutics can demonstrate, with increasing clarity, the utility of its platform in different therapeutic areas. There are also promising initial data from the two internal development projects in immuno-oncology, both of which could be of interest to pharmaceutical companies. The lack of R&D productivity has been a persistent issue for the pharmaceutical industry. Although investment in R&D has increased significantly over the years ($27bn in 2000 vs $59bn in 2015[PhRMA]), there has been no corresponding increase in new drug approvals. A root cause of the problem is poor initial compound selection during the drug discovery process. This originates from poor target selection or the selection of compounds from screening assays that fail to capture the complexity of biological systems. e-Therapeutics has designed its platform to address precisely this issue. Its network-driven drug discovery (NDD) methodology uses state-of-the-art technologies such as machine learning, artificial intelligence (AI), and proprietary network science techniques to identify compounds that can efficiently disrupt complex, disease related networks. The aim of the NDD approach is to produce novel and better drugs in a more efficient and effective way. The company’s drug discovery process is summarised in Exhibit 1, and complements the traditional approach. Essentially, e-Therapeutics’ in silico discovery engine filters an extensive library of c 10m compounds for those that have the potential to disrupt significantly a disease network. The selected compounds are subsequently screened in complex, highly discriminatory phenotypic assays; then the drug discovery process advances to the standard hit-to-lead optimisation stage. select drugs from its database that significantly affect those protein sets, either directly or indirectly. The hypothesis is that to achieve a better clinical outcome, interventions in complex biological networks need to be selected judiciously and be carefully targeted to disrupt efficiently a disease network. The network-driven drug discovery process is still evolving as technological advances begin to impact on mainstream disciplines, yet its ability to augment and leverage current practices is becoming clear. e-Therapeutics has used the platform successfully in eight different therapeutic areas, as shown in Exhibit 2. 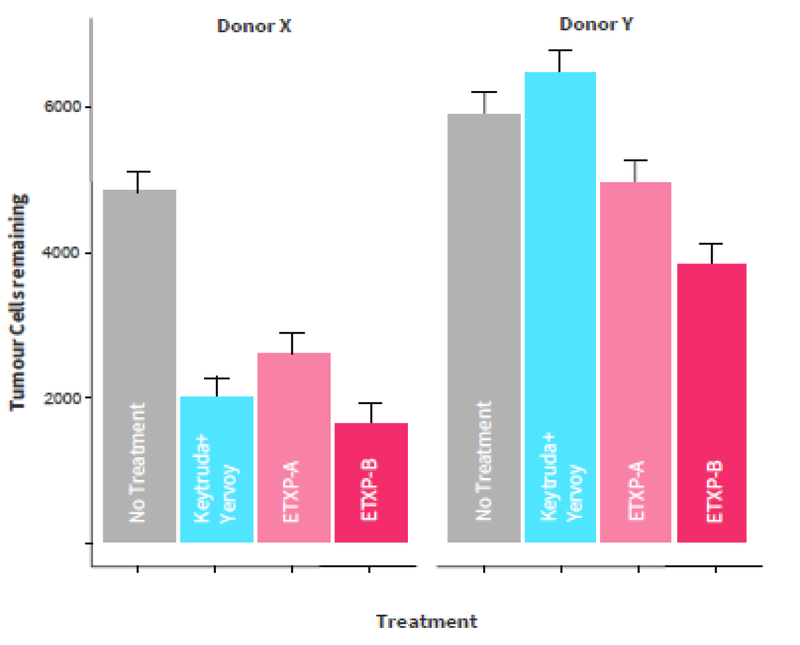 In the Hedgehog signalling project several hit compounds were identified and subsequently optimised to yield patented leads, that have equivalent activity to the approved drugs vismodegib (Roche’s Erivedge) and sonidegib (Novartis/Sun’s Odomzo). In in vitro preclinical studies with cells expressing the native Smoothened (SMO) protein and in an in vivo pharmacodynamic model the lead compounds were equipotent to the above agents. In cells expressing known SMO mutations they delivered superior activity to the above agents. Further information on this programme is detailed in our initiation report published in June 2017. Since then, the company has made good progress with the two immuno-oncology projects on which it is focusing its resources. 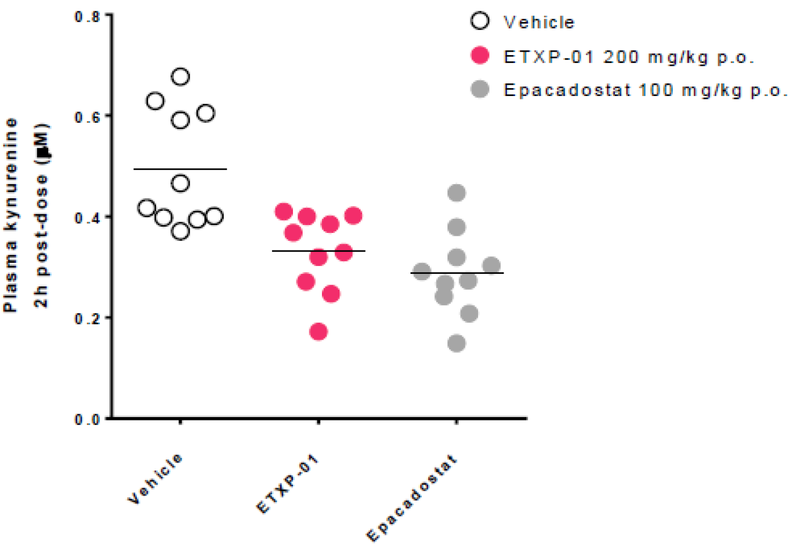 The tryptophan catabolism (breakdown) project has generated novel early compounds that, even prior to optimisation, have comparable activity to Incyte’s IDO1 inhibitor, epacadostat in both functional in vitro models of T-cell driven tumour killing and in-vivo models (Exhibit 3). Promising clinical data with epacadostat and BMS’s BMS-986205, both IDO1 inhibitors, have been presented, which support the hypothesis that reducing the breakdown of tryptophan can enhance the immune response against tumours (some cancers have low-levels of tryptophan in their microenvironment through increased IDO1 activity, leading to impairment of T-cell survival and growth). e- Therapeutics has not disclosed the targets of its compounds, but it has identified innovative compounds that appear to be acting by a novel mechanism of action; something that might be anticipated given the company’s approach. Source: e-Therapeutics, Trinity Delta Notes: 1Output from proprietary network analysis, removing promiscuous compounds; 2High level triage removing known drugs, applying Lipinsky Rule of 5, removing potential toxicophoric compounds etc; 3Commercial sources are only able to supply a limited number of “off the shelf” compounds to test; 4Activity of > 50% inhibition, at < 30 μM, with at least one cell-based readout, with no cytotoxicity; 5Activity of > 50% inhibition, at < 10 μM, in multiple cell-based assays, with no cytotoxicity, subject to IP and stricter medicinal chemistry triage criteria; 6e-Therapeutics limited the number of chemotypes progressed to control costs, other chemotypes could be progressed; 7FTO is Freedom to Operate in terms of chemical IP; 8Smoothen-independent inhibition of Hedgehog signalling; 9SIRS-systemic inflammatory response syndrome. The project to identify small molecule checkpoint signalling modulators is still ongoing, but it is already identifying promising small molecules. Initial phenotypic screens suggest the company has found two chemical series, with distinct mechanisms of action, that have comparable or better activity to the combination of immune checkpoint inhibitor antibodies, ipilimumab and nivolumab (Yervoy and Keytruda, respectively; Exhibit 4). act by two separate and unique modes of action (MOA). The next step with the tryptophan programme is to complete lead optimisation, and, with the checkpoint signalling modulation project, to carry out hit-to-lead work and further validate the two distinct and unique targets identified through the NDD approach. e-Therapeutics continues to assess the ability of its platform to target fibrosis, tumour microenvironments, neuro-degeneration, and macrophage polarisation, though no further information on these early-stage projects has been disclosed. Enabling the platform to target gene regulation networks (eg transcription factors). This investment in the platform should deliver incremental benefits, and allow e-Therapeutics to remain a leading player in the field of in silico drug discovery. While advancing the technology and the various programmes, e-Therapeutics has increased its commercialisation activities and we believe the prospects of at least one deal in the coming year continue to improve. As discussed above, the company continues to generate data supporting the utility of the platform across various therapeutic fields, and with its two immuno-oncology programmes. At the same time, big pharma is showing a greater interest in AI and related in silico technologies, and immuno-oncology programmes continue to attract considerable interest from pharmaceutical companies. in October 2017, GSK announced the formation of a public-private consortium with Department of Energy’s Lawrence Livermore National Laboratory (LLNL), the National Cancer Institute’s Frederick National Laboratory for Cancer Research (FNLCR), and the University of California, San Francisco (UCSF), which has the ambitious goal of reducing cancer drug discovery from six years to only one year using supercomputers. To gain access to e-Therapeutics’ proprietary data or novel compounds in sought after areas of disease biology. It is also worth emphasising that e-Therapeutics, following the outcome of the strategic review in July 2017 (see note published 24 July 2017), is only investing in therapeutic areas which are currently of significant interest to pharmaceutical companies. One of these projects could form the starting point to a collaboration, and this has been made more likely by the progress that has been made with the immuno-oncology programmes. It is very difficult to assess the value of any potential contract, and ultimately it will depend on the importance of e-Therapeutics’ technology platform to a pharmaceutical company’s discovery programme. At this stage we estimate that the NPV of the first deal could be c £15m, with subsequent deals worth between £25m and £50m. Our valuation of e-Therapeutics is unchanged at £53.8m, equivalent to 20.4p a share. This is in line with our conservative valuation approach, even though we believe the likelihood of a deal is improving, given the progress the company is making and growing interest in in silico drug discovery solutions by big pharma. Our valuation is based on only four potential deals as shown in Exhibit 5. We assume that deals are based on the current technology platform, including only core operating expenses (100% of SG&A and 50% of R&D expenses; the rest of the investment in R&D assumed to have an NPV of zero). Clearly, if e-Therapeutics forms a significant external partnership or collaboration, we would expect our valuation to increase significantly as we reduce the level of risk-adjustment, depending on the values of the potential deals. As the visibility of the validity of the investment case improves, typically with a stream of deals or collaborations, we would expect our valuation model to reflect the material upside that could arise. e-Therapeutics had £12.4m in cash on 31 July 2017. This was down by only £1.6m on the £14.0m held at FY17, compared to £3.7m in H116. This is because of the company’s more focused approach, which has significantly reduced its operating expenses. Its operating loss fell by 62% compared to H117, to £3.7m in H118, primarily due to R&D expenses being reduced from £6.5m to £2.7m. To reflect the careful control of expenses in H118 and the company’s continued focus on costs, we have reduced the estimated cash burn in FY18 by £0.5m to £5.1m, with minor changes to our forecasts in FY19. The amendments to our estimates are detailed in Exhibit 6. We still believe that e-Therapeutics’ has a sufficiently strong balance sheet to allow it to operate into 2019.